Alphonse Mucha was born on 24 July 1860 in the town of Ivancice in Moravia. He was the second son of Ondrej Mucha, who had six children from two marriages. Ondrej worked as an usher at the Ivancice court house. From his earliest years, Mucha’s artistic talent was evident. He could draw before he could walk – indeed his mother used to tie a pencil round his neck so that he could draw while crawling about on the floor. Very few of his early drawings survive, though an example of an early design can still be seen in the church in Ivancice where young Alphonse carved a monogram of his initials onto a church pew. Despite his talent, Mucha failed to gain a place to study at the Prague Academy of Fine Arts. Instead he took up a job arranged by his father in the court where he disgraced himself by making caricatures of the plaintiffs and defendants. Fate intervened in the form of an advertisement for apprentice theatrical scenery painters in Vienna. At the age of 19 Mucha was given his first job as a professional artist. Mucha had spent hardly a year in Vienna when the Ring Theatre, his employers’ main customer, burnt down. Rather than return to his family, Mucha decided to leave his future to fate. He travelled by train through Austria and into Moravia, getting off when his money ran out at Mikulov. Luck was on his side. Portraits Mucha drew in return for board and lodging attracted the attention of Count Khuen Belasi, the local landowner. Mucha was commissioned to paint murals by Count Khuen and his brother Count Egon, who was so impressed by Mucha’s talent that he agreed to become his patron. The Count took advice from a friend and agreed to sponsor Mucha to study at the Academy of Art in Munich for two years. He then agreed that Mucha should continue his studies in Paris. Mucha arrived in Paris in 1887. He was in the fortunate position of being supported by a wealthy patron and he was to enjoy this support for a further three years. With the withdrawal of the Count’s support, however, leaner times loomed. Mucha learnt to survive on a diet of lentils and beans and began to eke out a living by providing illustrations for a variety of magazines and books. Once started, he was soon able to establish himself as a successful and reliable illustrator. But it was on St Stephen’s Day (December 26th) in 1894 that fate singled Mucha out once again. He was doing a favour for a friend, correcting proofs at Lemercier’s printing works, when Sarah Bernhardt, the star of the Parisian stage, called de Brunhoff, the printer’s agent, with an immediate demand for a new poster for her production of Gismonda. All the regular Lemercier artists were on holiday, so de Brunhoff turned to Mucha in desperation. A demand from ‘la divine Sarah’ could not be ignored. Gismonda, the poster which Mucha created, was to revolutionise poster design. The long narrow shape, the subtle pastel colours and the ‘halo’ effect around the subject’s head were to remain features of Mucha’s posters throughout his life. Most importantly, these elements combined with the stillness of the near life-size figure to introduce a note of dignity and sobriety to what had been up to then garish street-art, qualities which were quite startling in their novelty. The effect created was astonishing and the poster so popular with the Parisian public that collectors bribed bill stickers to obtain them or simply went out at night and, using razors, cut them down from the hoardings. Sarah Bernhardt was delighted and immediately offered Mucha a five year contract to produce stage and costume designs as well as posters. 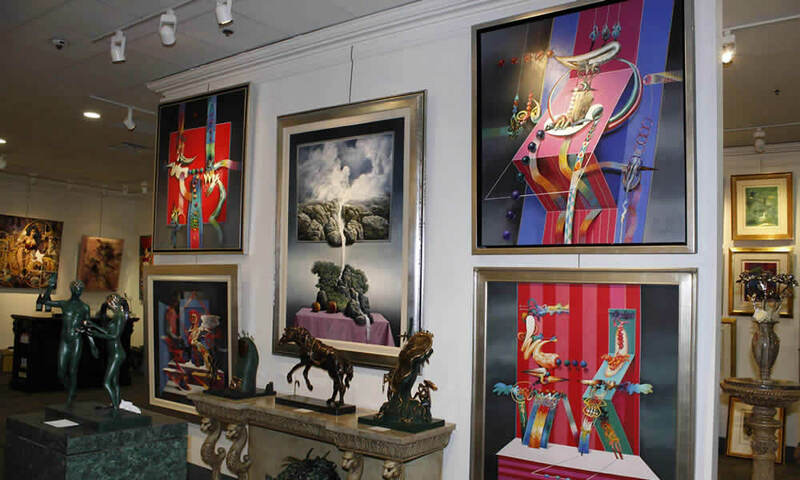 At the same time he signed an exclusive contract with the printer Champenois to produce commercial and decorative posters. With Gismonda ‘le style Mucha’ was launched. 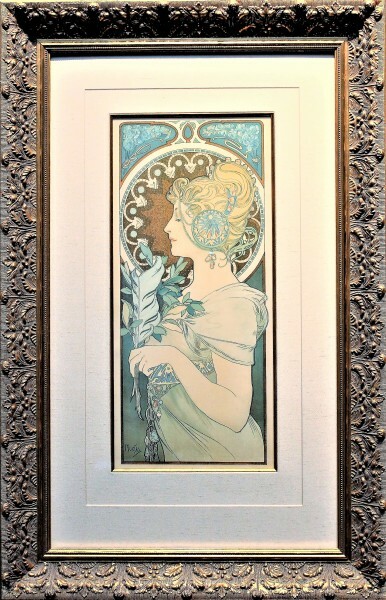 Mucha was established as the preeminent exponent of Parisian Art Nouveau. During the course of the next 10 years, Mucha became one of the most popular and successful of Parisian artists. Commissions flooded in – for theatre posters, advertising posters, decorative panels, magazine covers, menus, postcards, calendars. Mucha’s designs for jewellery, cutlery, tableware, fabrics etc were in so much demand that he conceived the idea of creating a ‘handbook for craftsmen’, which would offer all the necessary patterns for creating an Art Nouveau lifestyle. Documents Decoratifs, which was published in 1902 by the Librairie Central des Beaux-Arts, is an encyclopaedia of his decorative work. He also spent an increasing amount of his time teaching, first at the Academie Colarossi and later, with Whistler, at the Academie Carmen. In 1899 Mucha accepted a commission from the Austrian Government to design the interior of the Pavilion of Bosnia-Herzegovina which was to form part of the Paris International Exhibition of 1900. As part of his preparation, Mucha travelled in the Balkans to gather impressions and to sketch. The commission took 18 months to complete, during the course of which time he conceived the idea for the project which was to dominate the rest of his life – to create an all Slav epic, a monument to the struggles and achievements of the Slav people. But how to achieve this ambition? Despite his commercial successes, Mucha did not have significant savings – he was too ready to help out friends and good causes and he enjoyed collecting objects for his studio and entertaining. Mucha decided that he would have to cut himself off from the familiar temptations, that he must leave Paris and seek his fortune in America. It is possible that he was influenced in this decision by the example of Sarah Bernhardt who had enjoyed a number of highly successful American tours. He was also assured by American admirers in Paris that he would be able to earn substantial sums as a society portrait painter. In the event, the American dream was not as easy to catch hold of as had been promised. Mucha spent the best part of ten years in America, frustrating years nurturing a dream which could only be achieved with substantial sponsorship. But they were also happy years. In 1906 he married Marie Chytilova, a beautiful Czech woman 20 years his junior, and in 1909 their daughter, Jaroslava, was born. (Their son, Jiri, was born in 1915.) And in the end his decision was vindicated when Charles Crane, an American millionaire with a love for the Slav people agreed to fund the Slav Epic. Mucha returned to Bohemia in 1910. He spent a large part of the remainder of his life creating the 20 paintings which make up the Slav Epic. These monumental paintings, some of which measure as much as 6 by 8 metres, celebrate more than a thousand years of Slav history, divided between specifically Czech themes and those of other Slav peoples. The canvases were completed between 1912 and 1926 and in 1928 Mucha and Charles Crane officially presented the Slav Epic as a gift to the City of Prague. One of the conditions of the gift was that the city should provide a suitable building for permanent exhibition but no date was specified in the contract. Between 1929 and 1933 the canvases were exhibited in venues in Prague, Brno and Plzen, after which they were rolled up and put into storage. During World War II the canvases were hidden and they remained in storage for nearly 30 years until finally in 1962, through the efforts of the people of the Moravian town of Moravsky Krumlov, near Mucha’s birthplace of Ivancice, and the Mucha family, restoration work on the canvases was started. The entire Slav Epic cycle was finally placed on permanent exhibition in the castle of Moravsky Krumlov in 1968. It still awaits a permanent home in Prague. Mucha himself died in 1939. He was among the first to be arrested by the Gestapo following the betrayal of Munich and the subsequent German invasion of Czechoslovakia. Although he was allowed to return home after questioning, his spirit was broken and his health suffered. He died of pneumonia on 14 July 1939, ten days short of his 79th birthday. He is buried in Vysehrad cemetery in Prague.